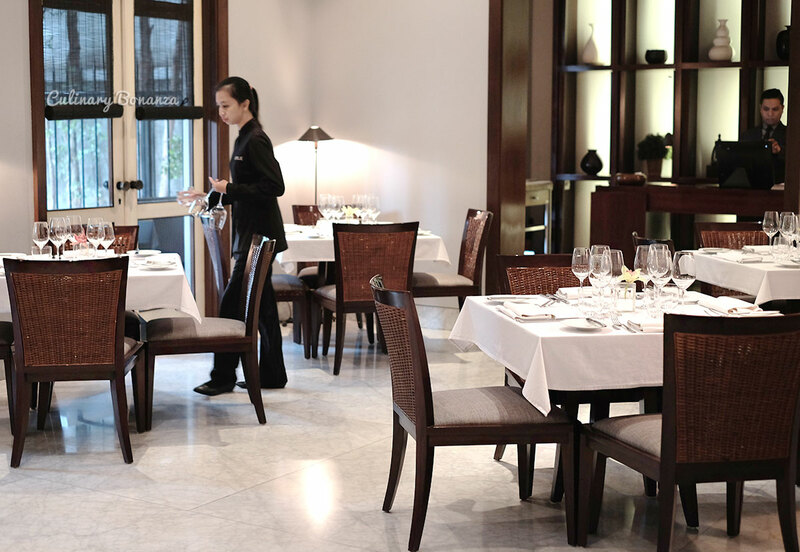 EMILIE French Restaurant has been around for a decade, way before the boom of F&B industry in Jakarta. A classic institution, the name has created an (almost) un-shakeable image of a chi-chi fine dining restaurant with prices that will burn a hole in your wallet at the end of the meal. How true is this hearsay? EMILIE is among the earliest to take residence on the presently prime hub for F&B scene in Jakarta, the Senopati - Gunawarman stretch. It's set in a minimalistic modern house with an outdoor courtyard for smoking guests, while the indoor dining area is strictly non-smoking (much to the relief of non-smoking guests like myself). Curious to bust the first myth: "This place charges ridiculous prices", I quickly scanned the menu that the staff promptly presented at my table. While the price of the 5 course Discovery set menu is what one expects at venues like this (IDR 1,280,000/person or IDR 2,080,000 with wine pairing), I am pleasantly surprised to find that there's actually reasonably-priced Brunch Menu (2 course for IDR 280,000 or 3 course for IDR 340,000). 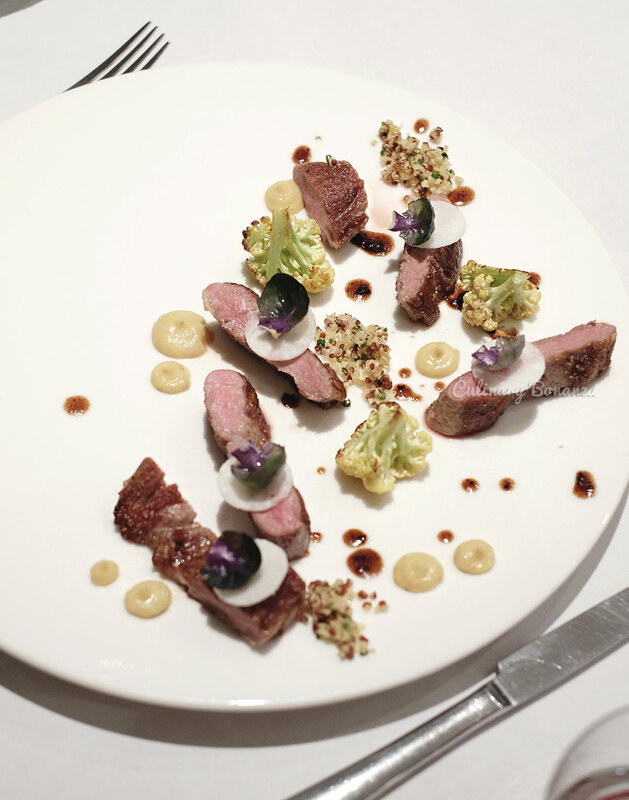 I had the 5 course Menu Decouverte, featuring 5 dishes which are also found on the a la carte menu. 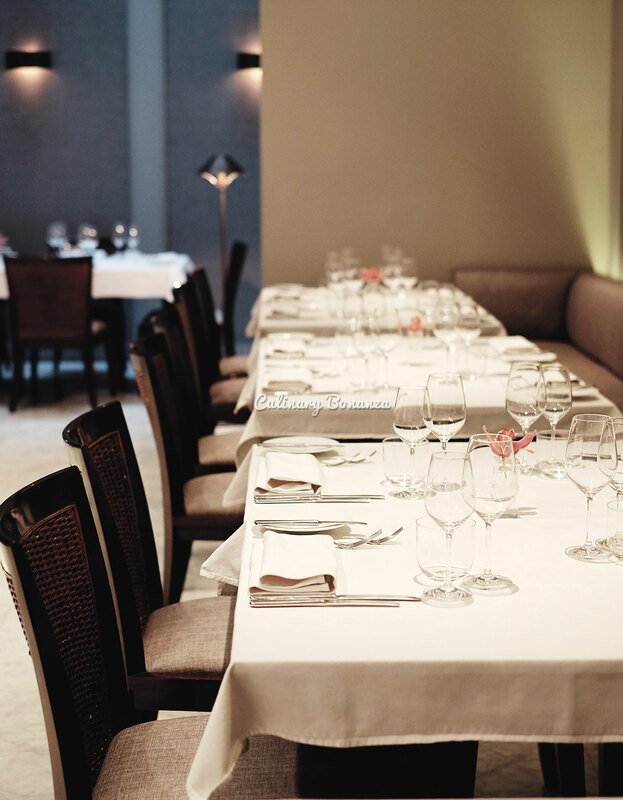 Combining all the values altogether, the Decouverte Menu is totally worth it. 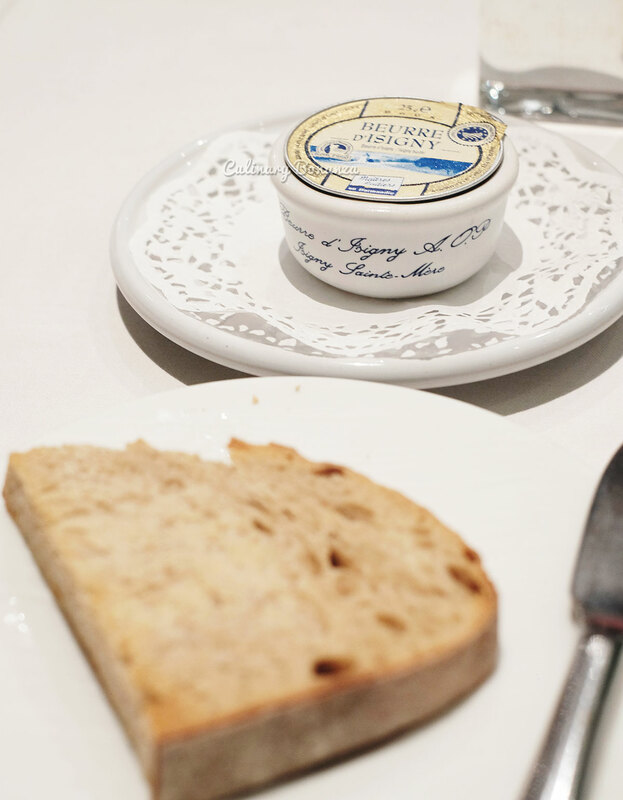 Any meals at EMILIE will first start with Bread and Butter, I'm glad to find my sourdough still warm and came served with an individual serving of Beurre d'Isigny. 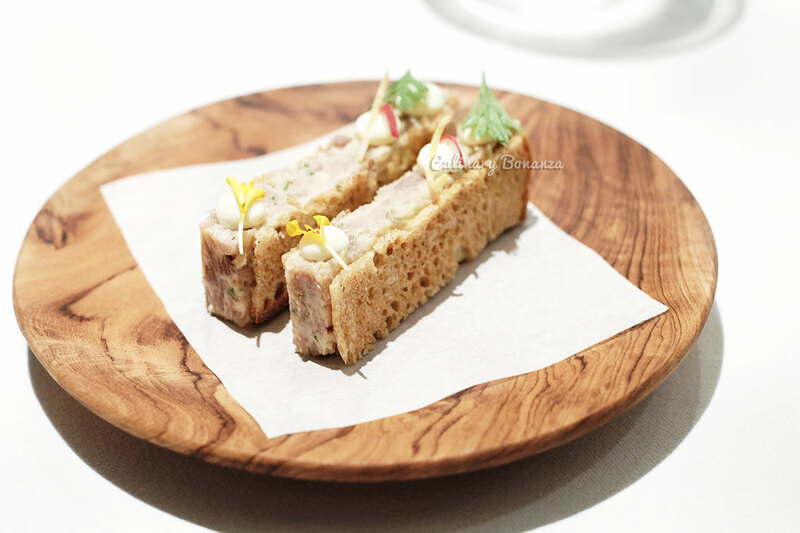 Then the first Amuse Bouche arrived (photos below), which appear as 2 pieces of petite duck rilette sandwiched in crispy bread. 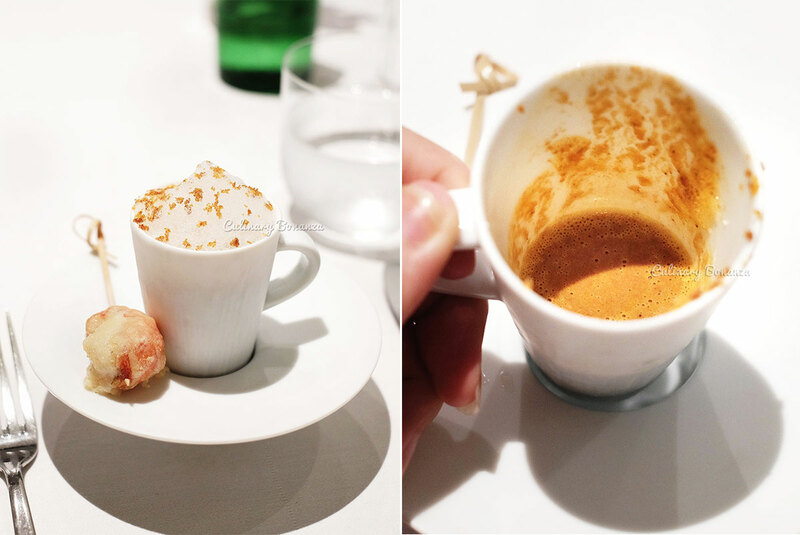 It was followed by a delightful cup of rich crayfish bisque topped with foam and bottarga shavings. I may not be a huge fan of seafood, but I could easily tell that this bisque took a lot of effort to create. I enjoyed every sip of it. 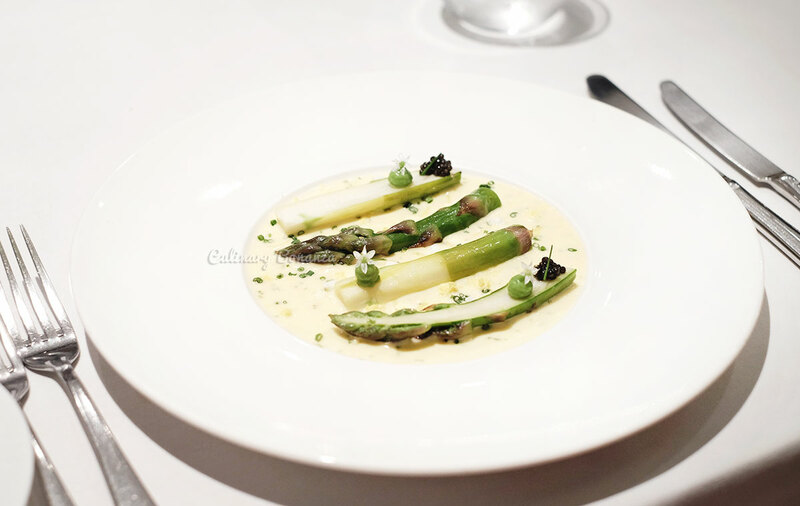 Premium Green Asparagus from Provence with Hollandaise, Egg Mimosa & Caviar d'Aquitane. I was quite worried that the Hollandaise would overpower the more subtle asparagus. 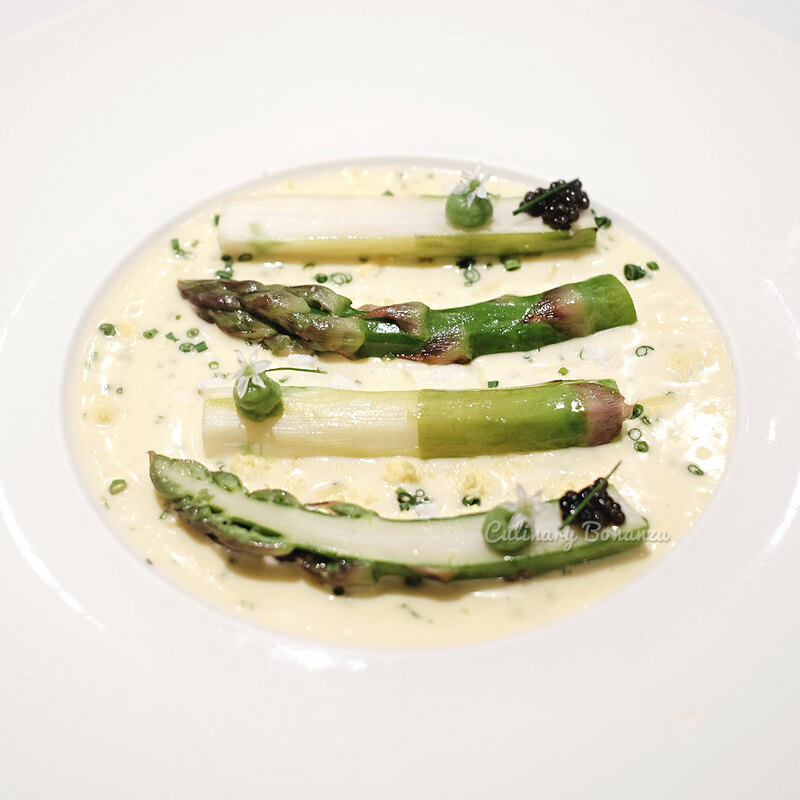 But fortunately, the Hollandaise was customized to be not as acidic & rich, allowing the delightfully sweet, juicy and crunchy asparagus to retain its status as the star of the dish. Foie gras Royale with Truffle Jus. I wasn't quite sure what the dish might look like, but it sure sounds expensive, as it's made with two supremely rich and potently-scented food ingredients known in French cuisine. 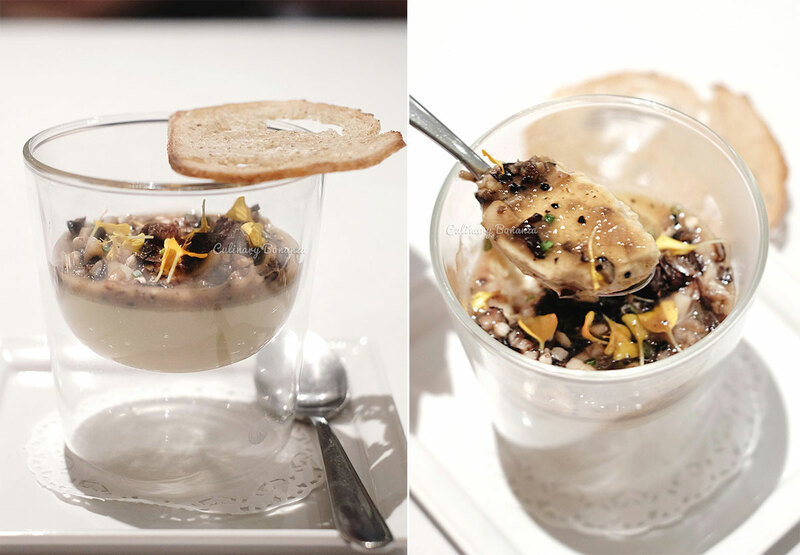 Turns out, a royale is like flan, but made with foie gras. It's a much more enjoyable way to eat foie gras, especially for those who are too squamish to look at the actual shape of goose liver. 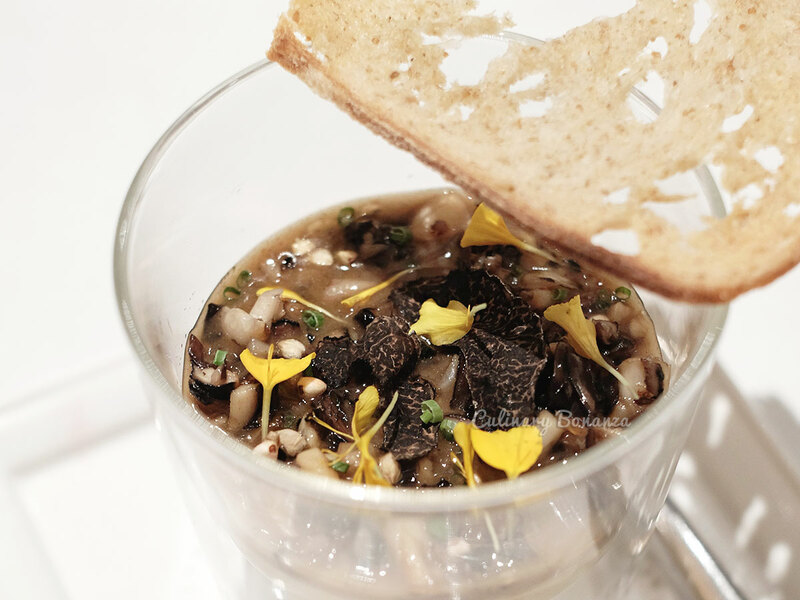 It gets even better with actual and generous black truffle shavings on top. That's it, I'm sold. Atlantic Turbot with ginger-infused white wine sauce & Chinese vegetables. Aside from the beautiful plating, I truly enjoyed the perfectly seared turbot. For your info, turbot is a type of asymmetrical flat fish, with protruding eyes which are only on one side of the fish' body. 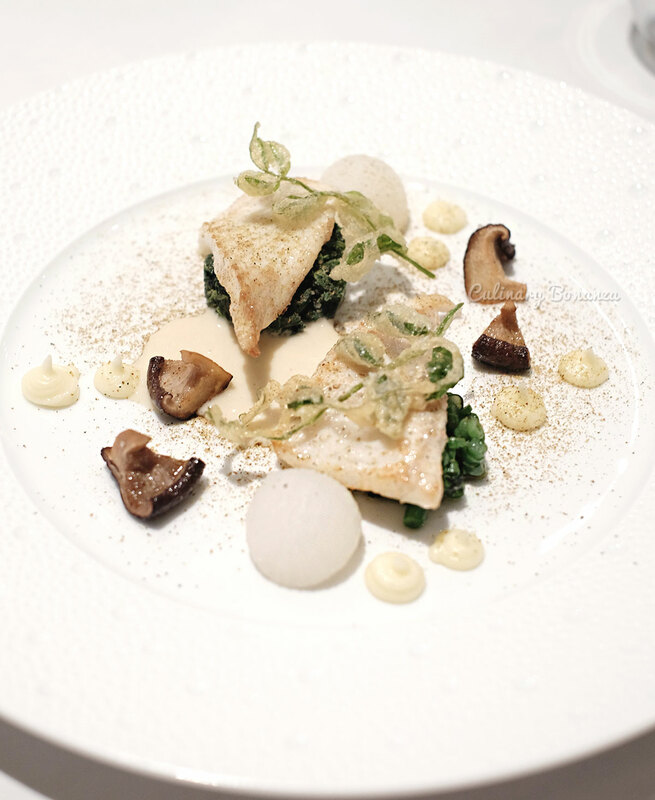 Turbot meat is rich, but not fishy at all (phew! ), firm but not chewy and somewhat sweet. 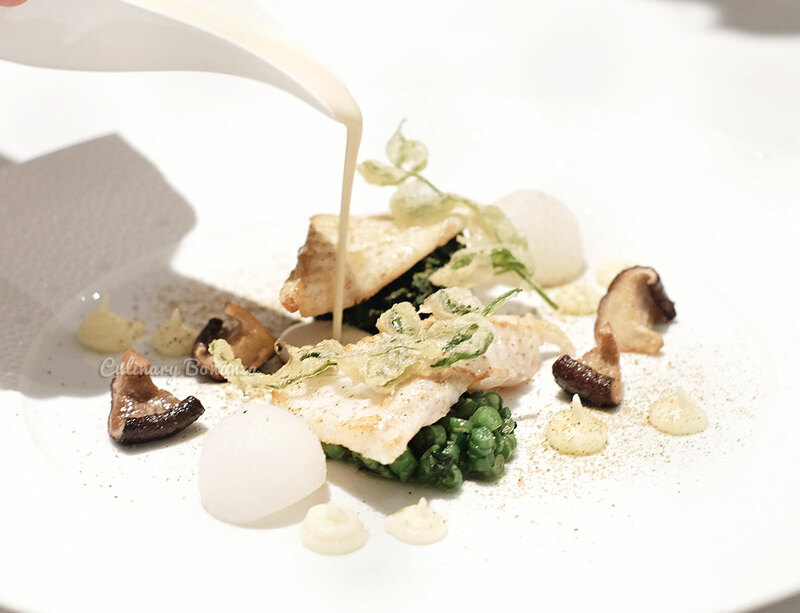 I have little wonder why turbot is in high demand at luxurious restaurants around the world. 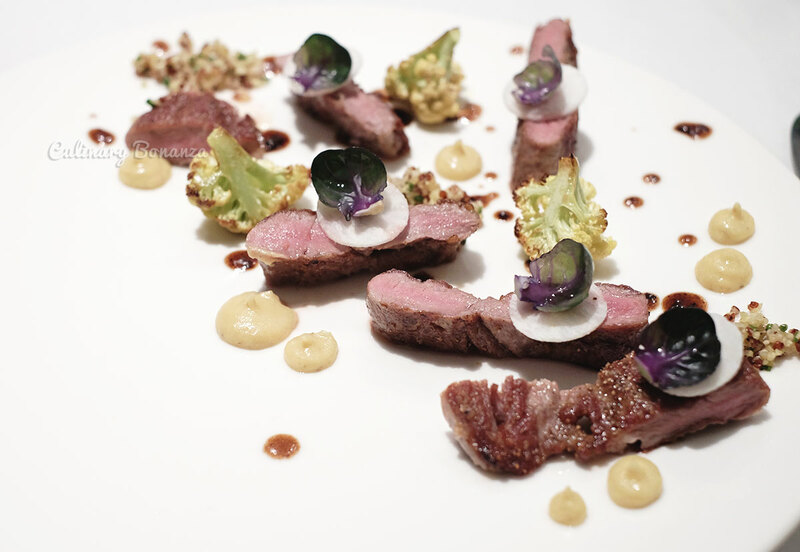 Feather Loin "Pluma" of Iberico Pork with charred cauliflower & raisin sauce. The name Iberique or Iberico automatically reminds me of the world famous Iberico ham or jamon, but I've never actually tried the meat as it is. This breed of pork is special because of the reddish meat colour (just like beef!) and the because they exclusively feed on acorn, the meat has a subtle nutty flavour. So, do not be surprised to find the meat still somewhat pinkish at the center, because that's the way this royalty breed of pork meat is best enjoyed. It is not dripping with juice, but the meat still manages to be tender and moist, while still crispy on the surface, not a combo one can get in beef steak. The portion IS generous ladies and gentlemen, so enjoy it slowly with the curry-oil fried cauliflower, quinoa, brussel sprouts and raisin sauce. 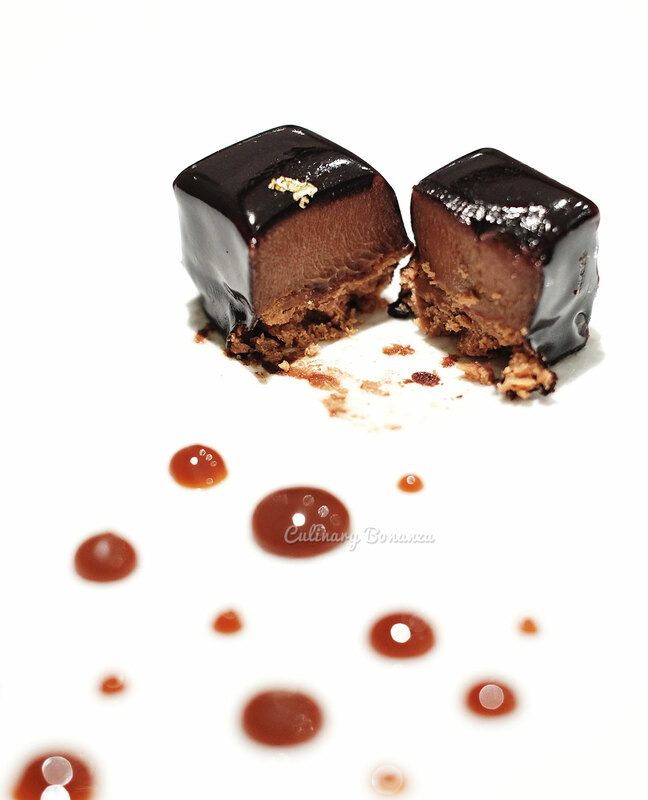 Croustillant of caramel & chocolate. It's like eating toffee candy, but imagine it as a much denser mousse, with dense and crunchy base, croustillant. Ps: if you're not into rich or sweet dessert, try requesting for something lighter, or fruit-based instead. Honestly, it has been a while since I enjoyed a fine French meal such as this in a non-wine dinner, non-event setting. Nowadays, there are many newer and glitzier restaurants with sky high food prices, but they are hardly worth the price. That's why I personally still harbour some reservations about immediately visiting new places that just opened 'yesterday'. As much as I try to be objective all the time, the trauma from a bad experience can last a lifetime, but a pleasant meal like this will make me sing praises to anyone asking me to recommend a place to have great nouvelle cuisine in Jakarta.